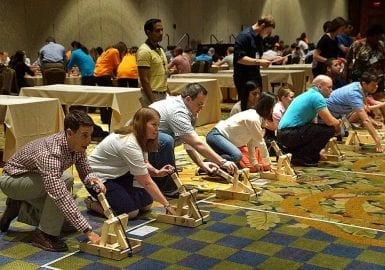 This fast-paced construction and launch program starts with a fun accuracy icebreaker involving piece-together, mini catapults that we provide. 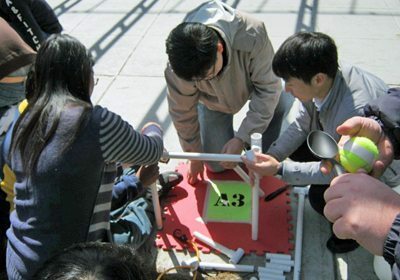 After forming teams, your group will reach a new high with Catapult, a highly competitive event in which teams use their creative brainpower and problem-solving skills to construct a working catapult which, when completed, will launch objects for distance and accuracy. Each team first completes a 10-minute, hands-off inspection of their materials, taking inventory and sketching an initial catapult design. At the word “GO,” teams will access their materials and start building. With only 30 minutes in this initial phase to build and test the launcher, there is no time to waste. 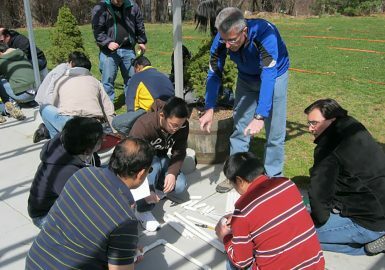 Completed catapults are put to the test during two separate launch phases, which truly add to the challenge of this fun team building event. Phase 1 is the “launch-for-distance” competition utilizing a grid where measurements are marked in 5-foot increments. 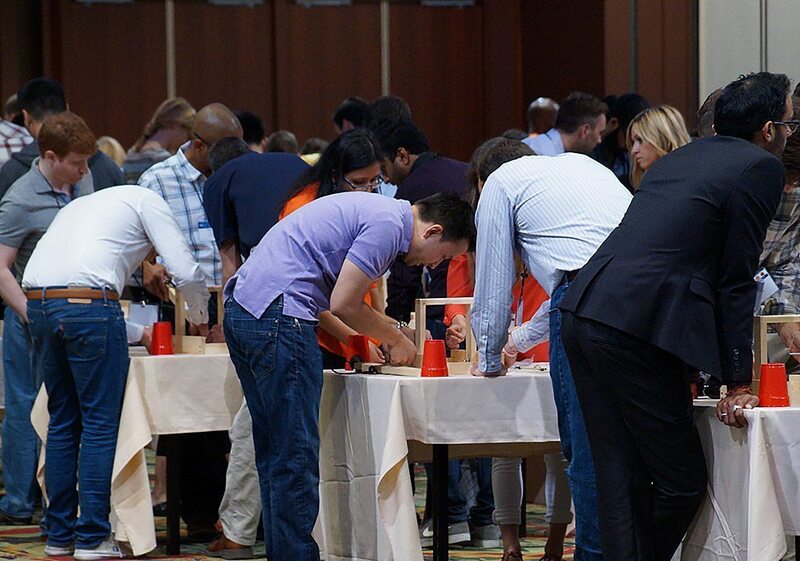 To share the fun and ensure full participation, we rotate team members through the various roles required to compete. At the end of the first round, points are tallied and the scores displayed. 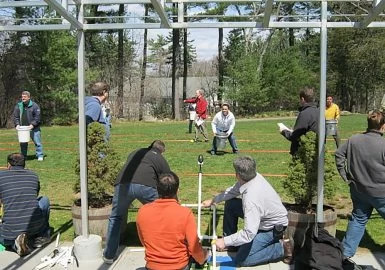 Phase 2 tests the “distance-and-accuracy” of the launcher with team members catching objects in various-sized containers and at different distances. During this hilarious phase of the Catapult competition, the pressure to perform is high as each team attempts to maximize its points. When the competition ends, the final scores will be tallied and the winning teams announced. 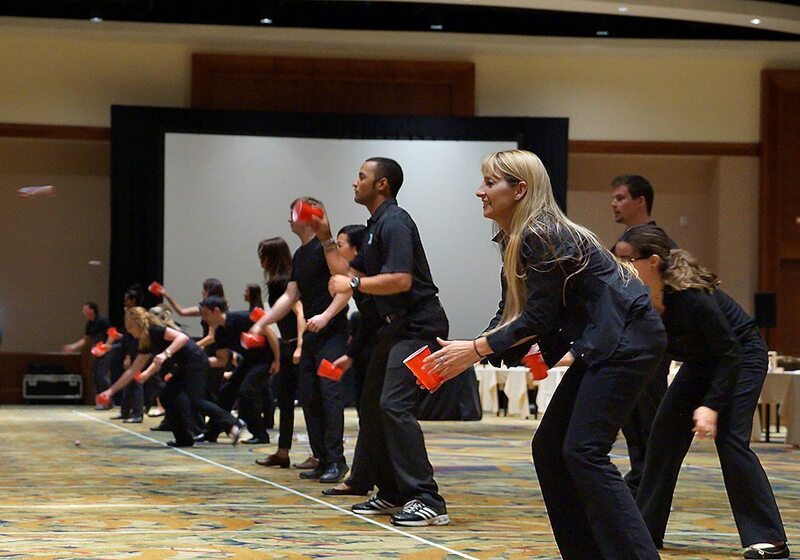 This is a fun and creative high-energy event that will leave your group exhilarated, as the winning teams take the stage to receive their medals. Your Catapult team building program was innovative, creative and a fun competition. Who would have thought we could build a catapult that flings things so far. What else could we ask for? It was just like Junkyard Wars on TV. Our group had a great time! The best part about our Catapult program was watching teams of very diverse people (global, sales/technical) find individual skills that could be used to meet the goals of the experience. 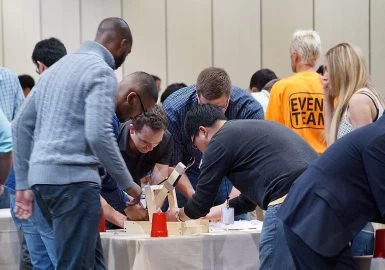 The most fun for the individual teams, it was building and testing the catapult, but the most fun for the whole group, it was listening to the "marketing" presentations the teams came up with about their Catapult. All the feedback I got was highly positive. It was all well done and I don't think there is anything I would change. Everyone was engaged and active, from the first warm-up activity through the end thanks to your great facilitator. He was one of the best I've seen in 13 years; clear, engaging, respectful, adapted the basic plan to our requirements flawlessly and had enough energy to drive home the transfer of learning to real-world work in the debrief. Our group loved working together on the Catapult construction. I'll pass our experience on to the other IPTD facilitators. I suspect you'll hear from one of them soon. I just wanted to shoot a BIG THANK YOU to your group. 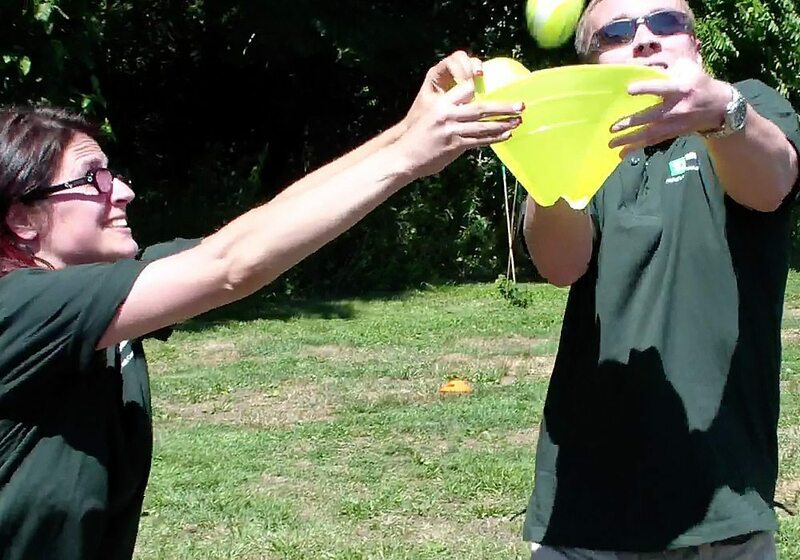 Your lead facilitators did a terrific job with our Catapult event and the team had a blast! 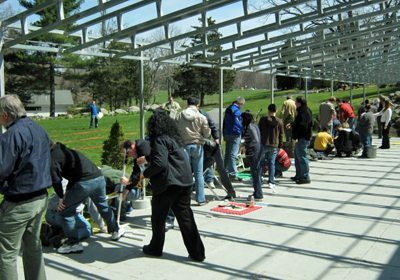 The best team building aspect of our Catapult program was that everyone was involved. People really weren't able to not participate! The most fun was actually making our own catapult and our group is a whole enjoyed the activities. I know everyone loved it. Overall, it was a great time. Becky, Will-Son Distributing Co, Inc.